Showing 1 - 4 of 4 Products for Direct Injection High Pressure Fuel Pump. Each High Pressure Fuel Pump is manufactured to exacting standards. Designed and manufactured to stringent quality standards at a certified facility, so you can install with confidence. Premium components and durable materials withstand harsh engine conditions to increase longevity and lifespan. As a global manufacturer, we have complete control of the manufacturing process from componentry to finished product. 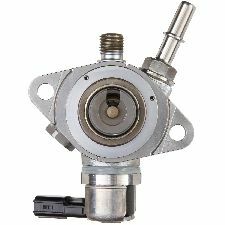 Spectra Premium high pressure fuel injection pump provides reliable and continuous operating pressures for stable fuel combustion at low and high speeds, contributing to an efficient engine operation. The advance technological design integrated in these fuel pumps minimizes negative impacts on the engine, facilitates improved fuel economy and reduces harmful emissions. Direct-fit OE replacement ensures ease of installation. Designed and manufactured to stringent quality standards at a certified facility, so you can install with confidence. Premium components and durable materials withstand harsh engine conditions to increase longevity and lifespan. As a global manufacturer, we maintain complete quality control throughout the manufacturing process.